For those of you who haven't heard of the Harlequin KISS line and like a fun, flirty romance read, you are missing out! I received a Netgalley.com E-Arc of What the Bride Didn't Know and want to share it with you so you can put it on your wishlist or go ahead and pre-order! The paperback is available October 22nd and the e-book comes out November 1st! Imagine two people who have been tip-toeing around the elephant in the room until circumstances cause the elephant to grow beyond the room... that's what happens to Lena and Trig in this book and I have to say that I loved watching the interplay and the 'dance' as they fight the attraction that has been building for more years than they probably want to admit. I also love that this book has a little drama and a meaty special ops/spy type story line that adds to the intrigue and creates scenarios that come to life in a unique way! I love the interplay and character development in this book and can't believe it's packed into such a nice neat package. It's perfect for a quick weekend read or to keep tucked into your purse to read on your breaks (or in car rider line like me). 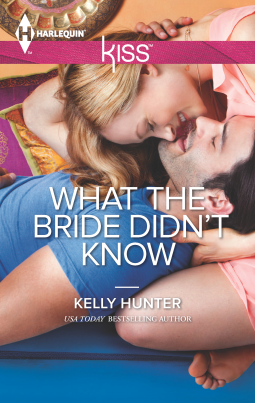 If you like a fun, flirty read with a ton of sass and great character development, then check out What the Bride Didn't Know by Kelly Hunter!